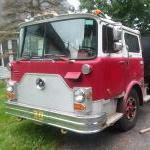 I have a 1969 Mack CF Pumper with the EN707F Gas motor. Wondering if anyone has a good source of consumable parts. My current challenge is for oil filters. I was told that Mack stopped producing the 236-gb-222 cartridge filter a few years ago and stock has all but dried up. Has anyone successfully used another brand of filter? Any special gaskets or modifications needed? I have not found any good cross references. I love this truck. Thanks for the assistance.